In Ancient Greece it was forbidden to export figs (called ‘syco’ in Greek). Furthermore, people were encouraged to expose those who secretly exported figs for profit. Some used this as an opportunity to falsely accuse others of this crime, to take personal revenge. This is where the modern word sycophant comes from. Porridge is a traditional Scottish food. I took this nutritious dish and added a Mediterranean twist to it with some extra beneficial, fragrant and colourful ingredients. Saffron is a precious spice with numerous health benefits, including anti-tumour activity and anti-depressive effects, which are currently being researched. You can find good quality saffron in a Persian or Middle Eastern shop where it is often cheaper than the high-street supermarkets. 1/3 tsp ground saffron (or a small pinch of saffron threads roughly cut with your fingers). Alternatively, make ‘saffron water’ the previous day by adding 1 cup boiling water to the saffron threads and leave overnight. Bring the milk and water (or saffron water) to a boil in a non-stick pan. Add the oats, raisins and goji berries and mix well. Add the cinnamon stick, cardamom pods and ground saffron. Cook slowly on low heat. Simmer until the mixture reaches a creamy consistency. 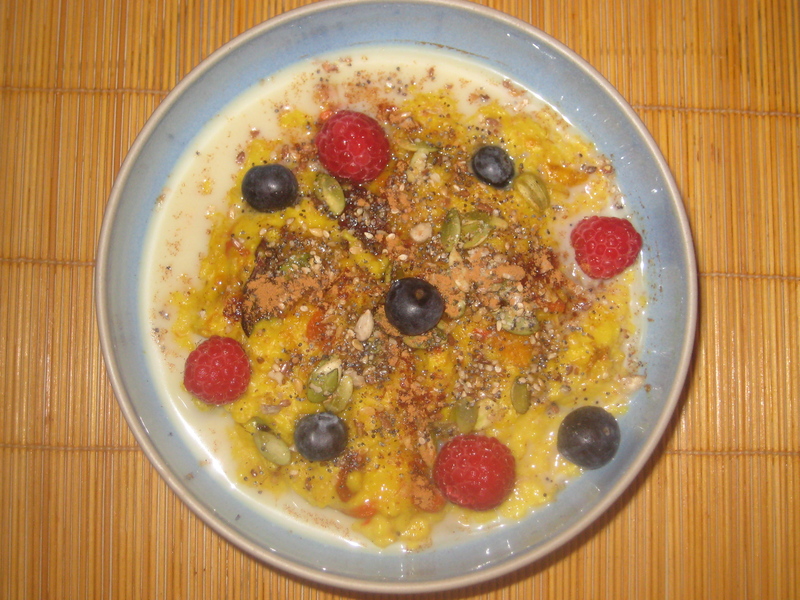 Spoon the porridge into individual serving bowls. Sprinkle the ground seeds, cinnamon powder and berries. Serve hot with milk and honey. Enjoy the smell and the colours. Taste it and appreciate the textures. It will give you energy to start your day.